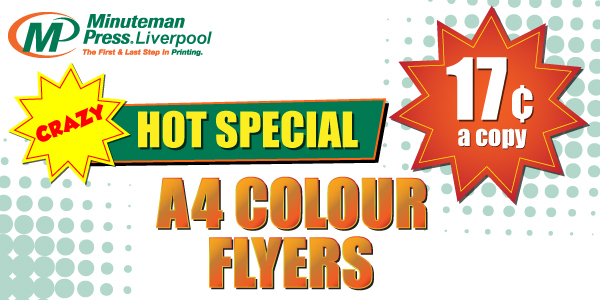 Don't miss this unbeatable Crazy Hot Special on A4 colour flyers printed on one side using 150 gsm gloss art paper. This offer is based on supplied print ready artwork and a minimum order of 500 copies. Design charges can be provided at a great price! The offer is available for a limited time; so hurry and place your order or call us for more details. This offer is not available with any other store discount offers or vouchers. Price does not include GST. Free your mind and let us handle everything from design and production to delivery where we mail your flyers for you using direct mail distribution! A flyer should grab the attention of a potential customer. The design and message needs to be clear and enticing to gain the prospective buyer's interest. We print on all paper stocks from lightweight inexpensive to high quality premium papers and card stocks and also offer multiple options to professionally finish your project. Flyers have always been effective forms of communication, especially when created and produced by our professional staff at Minuteman Press Liverpool.